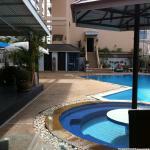 Stop at Ting Tong Red Guesthouse to discover the wonders of Pattaya. The hotel offers a high standard of service and amenities to suit the individual needs of all travelers. To be found at the hotel are free Wi-Fi in all rooms, Wi-Fi in public areas, car park, room service, airport transfer. Guestrooms are designed to provide an optimal level of comfort with welcoming decor and some offering convenient amenities like air conditioning, wake-up service, fan, television, satellite/cable TV. To enhance guests' stay, the hotel offers recreational facilities such as outdoor pool. A welcoming atmosphere and excellent service are what you can expect during your stay at Ting Tong Red Guesthouse.